Rectilinear Displacement positions the viewer in an extended mechanical linear motion - of up to 40 metres - through an exhibition space. 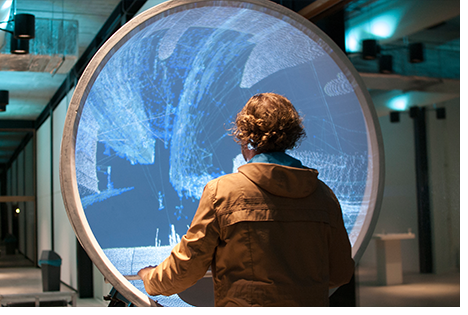 At the same time, the user is visually immersed in a virtual space that is projected on a spherical screen. The images are constructed from 'laser scanned point clouds' consisting of a pre-scanned 'x-ray like' representation of the entire complex and a real-time dynamic scan of the exhibition space itself. 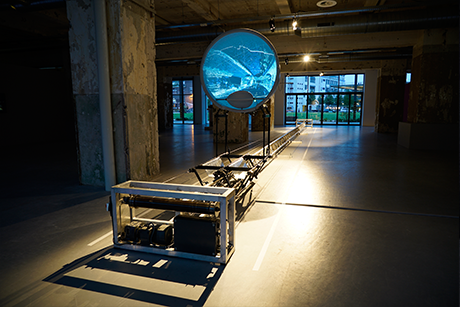 In this installation the concept of 'forward travel' or the 'forward traveling-shot' is explored. This term, used in cinematography denotes the onward motion of a camera as in the example of driving a car - where you can simultaneously experience passing landscapes from both sides of the optical axis. A popular early cinema genre based on this camera movement is the Phantom ride: a style of film-making that popularised the idea and experience of motion created by the movement of the camera itself as opposed to the movement inside a static frame. The installation Rectilinear Displacement reverse engineers this typical cinematographic travel by not presenting the output of a moving camera but by putting the viewer inside the camera, itself. 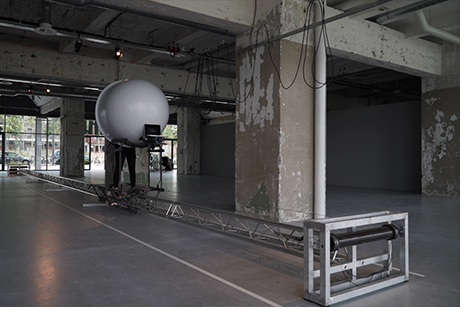 While moving along the rail, a laser scanner creates two-dimensional slices of the room (or area) and generates a real-time three-dimensional representation of the exhibition space. By transforming the static 3D scanning aesthetics into a dynamic cinematographic experience, the spectator becomes the center of a highly immersive mediated version of his surroundings.